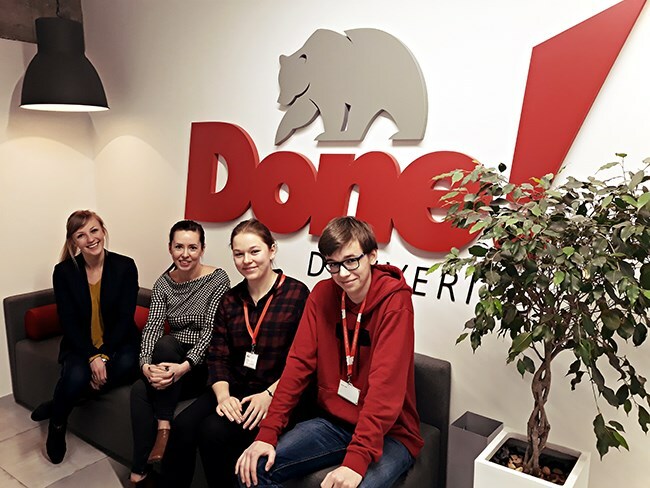 New Interns at DONE! are almost our everyday guests. Recently Patrycja and Daniel could get familiar with TSL under careful supervision of our specialists. Read about their time at DONE! Internships at DONE! Deliveries are wonderful. During the fantastic presentation of DONE! at the Entrepreneur Week - I decided it would be my place of practice. Quick contact with their HR department and few days later I signed the contract with the company. Do you want to learn secrets of TSL business? I assure you will become a logistics specialist among your friends. Is your internship focused on accounting? DONE! Or maybe you want to test yourself in customer service? DONE! of course! Are you interested in IT? Young, positive and very organized team - DONE! 4th floor - already opened! Due to significant growth of our DONE team we knew a much larger office space would be necessary soon. You should know that new people are constantly coming to DONE! DONE! Deliveries – an FT1000 company! Financial Times & Statista have just published the third annual ranking of the fastest growing companies in Europe. Companies from Germany, France, Italy and UK are dominating but we are proud to state DONE! Deliveries is also there! Some time ago we managed an interesting order. We had to transport building materials from Germany to a Spanish island - Teneriffe.